LG OLED55C7V review | What Hi-Fi? Calling LG’s 2017 OLED range a success is a bit of an understatement. It’s an odd range, though: every model has exactly the same panel and picture-processing tech. The main differences are the styling and speakers. You can spend £8000 on an LG OLED if you like, but its picture will be no better than the £2500 OLED55C7V (C7 for short) we have on test here. The C7 is even more similar to the B7 than it is to the rest of the range. The two are separated only by the pedestal stand and some other slight aesthetic details. There's a difference in availability, too: you’ll find the B7 from practically any retailer that sells TVs, but the C7 is exclusive to Currys. Given the B7 (also now available for £2500) has already received a five-star verdict, it seems obvious the C7 will too. It’s rare the pedestal stand is the most interesting aspect of a TV’s design, but - as the most significant aesthetic difference between the B7 and C7 - it warrants instant discussion. The Currys exclusive has what LG describes as a “stiletto” stand, undoubtedly intended as an extra injection of elegance. Opinions are divided among the What Hi-Fi? team, though, with some prefering the B7’s crescent. Both have similarly super-thin bezels, a profile that’s mere millimetres at most points and only 5cm at the thickest point (where the connections and processing bits are), and a face unblemished by unsightly speakers. In this regard, at least, having the least capable audio system can be seen as an advantage. All told, this is a neat, clean and stylish set that will make you the envy of any visitor. Once you’ve marvelled at the minimalist design, it’s time to switch on your new OLED TV. As with the last couple of generations of LG TVs, cartoon character Bean Bird is present to take you through one of the most welcoming and simple first-time set-up processes around. Bean Bird doesn’t cover everything, though, and while the LG generally does a good job of selecting picture settings that suit whatever you’re watching, there are a number of options you can tweak to get the best out of it. You should start by switching from the Eco mode to Standard and turning off Energy Saving. Extra efficiency is all well and good, but (as with most TVs) these modes hamper picture quality significantly. We also recommend dropping the Contrast setting by a few points to release more detail in whites, then dialling Dynamic Contrast up to Medium to add an extra layer of punch. Have a play with the TruMotion settings, too. Everyone responds a little differently to motion-processing, but we can't imagine many will approve of the C7’s quite aggressive defaults. Even a small amount of de-judder and de-blur can occasionally add artefacts to fast, complex motion, and the best way to know what works for you is to experiment with the modes. Before you leave the LG’s menus, switch High Dynamic Range on for any HDMI input with an HDR source connected. If you don’t, you’ll miss out on all of that glorious extra contrast. Once your Standard picture mode is perfectly calibrated, copy the settings to all of the TVs inputs, so all of your sources benefit from your tweaks. Be aware, though, that when the TV senses an incoming HDR signal it automatically switches to the Cinema Home mode, which won’t reflect any of your changes. Thankfully, Cinema Home mode is pretty good – we’d recommend dipping into the White Balance menu to switch from Medium to Cool and apply your preferred TruMotion settings again. People who watch movies in a dark room might want to make the same tweaks to Cinema, too. 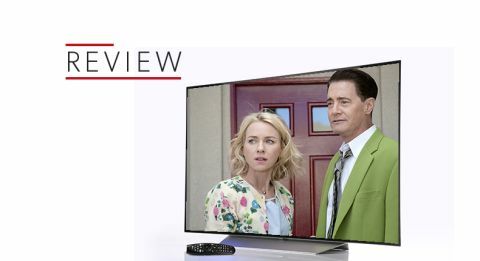 Only LG’s 2017 TVs support Dolby Vision out of the box (Sony’s A1 will be getting it as an update later in the year), so your first port of call should be Netflix’s growing selection of Dolby Vision content. Marco Polo may not be the finest programme available for streaming. But it is one of the finest-looking, and its combination of dark rooms, open flames and intricate clothing makes it a stern test for any TV. It’s a test that the C7, just like its sibling B7, passes with flying colours. Blacks are inky and pure, but they don’t drown the detail – you see everything you’re supposed to. Of course, OLED’s trademark ability to combine those fabulous blacks with brilliant whites on a pixel-by-pixel basis is present and correct, and the result is superb contrast. True, most LCD TVs with a separate backlight will go brighter (much brighter in the case of a premium model such as a Samsung QLED), despite the 25 per cent increase in brightness for LG’s 2017 OLEDs. But contrast is about more than peak brightness, and for us OLED is the clear winner here. The only rival for the LG C7 in this regard is the Sony KD-55A1, which somehow manages to combine LG’s blacks with even punchier whites and colours. The Sony has the edge when it comes to detail and sharpness, too, but the LG C7 is no slouch - scenery being crisply, solidly defined, and skin blemishes and clothing fabrics realistically rendered. It may not enhance these elements quite as well as either the Sony KD-55A1 or the Samsung QE55Q7F, but the C7’s picture is effortlessly natural and you never question whether what you’re watching is what was intended. Non-Dolby Vision HDR content from Amazon Prime Video or a 4K disc is handled with almost as much aplomb, and even taking a step down into 1080p territory doesn't prevent the C7’s fundamental strengths coming through. Contrast remains the stand-out element, but for detail, definition and colour the LG continues to strike a near-perfect balance between being thrilling to watch and entirely realistic. Motion is superb throughout, too – it may lack the sort of Goldilocks processing settings the Sony KD-55A1 has, but the panel is fast enough for natural, smooth motion even with TruMotion switched off entirely. Watch standard-def content and you’ll find the LG's performance little short of miraculous. Considering the TV is making up the majority of what you’re seeing, the level of detail, sharpness and clarity to the image is astounding. Only another LG OLED can match the C7 in this regard. For gaming, the LG is also hard to beat, thanks to input lag of just 21.4ms and just the sort of detail, definition and contrast to make the most of the latest and greatest console games. HDR titles such as Horizon Zero Dawn look especially stunning on this set. Like the OLED55B7, the C7 gets the most basic audio system of all of the 2017 LG OLED range, but that’s still a 2.2 speaker system carrying the Dolby Atmos logo. Don’t get too excited about Atmos, though - it’s a far cry from what we’ve come to expect from spatial surround systems. In fact, forget the Atmos thing altogether. We probably shouldn’t have even mentioned it really. Sorry about that. Approach this as you would any other flatscreen speaker system, though, and you’ll be pleasantly surprised. The downward-firing drivers result in a sound that’s not particularly direct and that doesn’t project into the room all that well, but that is spacious, clear and relatively dynamic by TV standards. The LG E7 sounds a bit better, and the Sony KD-55A1 sounds a whole lot better - but don't forget that we’d recommend partnering all of these TVs with a separate sound system, so the C7’s comparative deficiencies shouldn’t matter to those who heed our advice. WebOS (now in its 3.5 iteration) remains one of the nicest, snappiest and most useable TV interfaces out there, with Samsung’s own interface being the only one to run it close. It’s colourful and intuitive, and customisable in terms of the features and sources you see. In short, it gets you to the content you want quicker and with more panache than almost any rival. It’s certainly a huge step-up from the sluggish, slightly buggy Android OS the Sony KD-55A1 runs on. The latest version of LG’s Magic Remote combines the motion-sensing pointer elements of previous designs with a full suite of buttons to give you the best of both worlds. Dedicated Netflix and Amazon buttons are becoming par for the course, but LG goes one step further by adding the ability to create shortcuts to favourite sources and apps via long-presses of the number buttons. LG says this C7 performs exactly like the B7, and we agree. We experience almost no differences in the picture quality, and those we do notice (a very slightly warmer image on the B7) are ever so slight. So if the C7 is the same as the B7, it gets the same score – a full five stars. Which of the two you choose should come down to which you think looks prettier, and where you prefer to shop. But the C7 also has the same problem as the B7. That problem is the Sony A1, which builds on the raw materials provided by LG (the Sony KD-55A1 uses an LG OLED panel) with software that makes it even punchier and insightful. When we reviewed the B7, we said the Sony was worth the extra £500, but if the gap widened the LG could become the 2017 OLED of choice. Both the B7 and C7 have been discounted since that review, but then so has the Sony. There’s still £500 between them. So - for the time being - our advice stands.